Even the United States government, kowtowing to commercial interests, does not want to support and acknowledge the value of mother’s milk. The North Carolina Legislature’s latest move is a proposal to ban any “milk” that is not from a creature. “Almond milk,” for example, is artificial; therefore, it is not milk and cannot be so named. Kurlansky’s comprehensive gulp on the history of milk spans the Earth, focusing in part on England, Iceland, China, Tibet, and the United States. More than 100 recipes are interwoven into his compelling narrative where one can learn how to make Irish scones, Cato’s cheesecake, Paneer Makhani, beurre blanc, fried milk, yogurt, or hot chocolate. Dominican batida de lechosa, fromage à l’angloise, fudge, and kalakand (a milk-based sweet from Rajasthan) are also featured. Recipes are included because they are “invaluable artifacts. They teach us about societies and the social order in which they are created.” Readers will enjoy imagining how these recipes taste, all while pondering their history, such as whether Cato cooked to reduce the stress of public life. Milk destined for human consumption comes from a variety of animals. Tibetan yaks are suited for the high altitudes in which they live. Yaks provide nomads with skin and hair for clothes and tents and some meat, although yak milk and dairy products are the nomads’ primary foods. Sheep’s milk is important in Basque, Iceland, and India. The limited availability of grazing land for cattle gave rise to the value of sheep which could survive and thrive on the rocky bits of grass. Cattle are prominent elsewhere in the world: the volcanic island of Sao Miguel in the Azores, for example, has two cows for every human. Kurlansky has written on a variety of subjects as their interest moves him, such as Cod, Salt, and Paper. His remarkable ability to bring such seemingly simple subjects to comprehensive life has resulted in best-sellers that continue to entertain and educate readers. 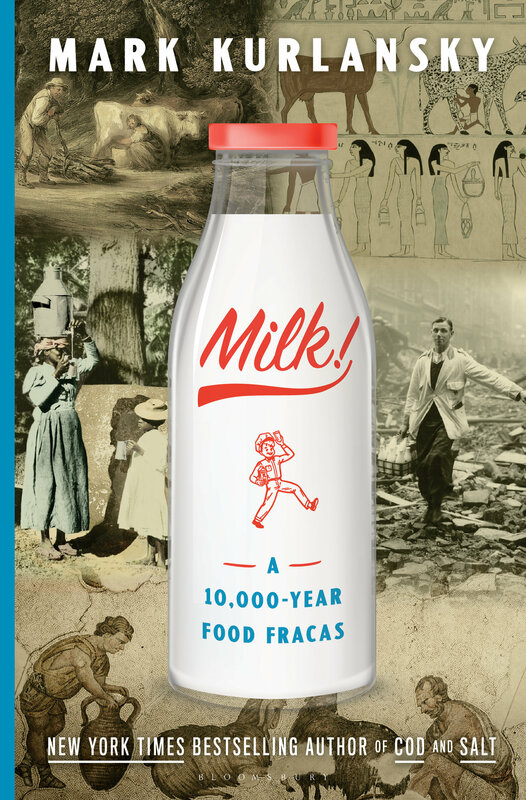 Who would have believed there was so much to be learned and written about milk from various animals, how hot and cold climates affect both sources and usage, and how religious beliefs and prohibitions have affected its consumption.